Sign up for e-Notify to receive license expiration reminders and status updates via email or SMS for all your licenses. 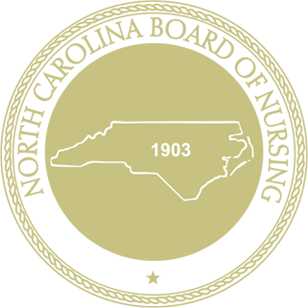 The Board of Nursing's electronic database serves as the primary source of licensure information for nurses in North Carolina. Renew your Registered Nurse or Licensed Practical Nurse licensure via the Nurse Gateway. Apply for Registered Nurse or Licensed Practical Nurse licensure by Examination, Endorsement or Reinstatement via the Nurse Gateway. Find and utilize services, forms and applications offered by the Board of Nursing. The Board of Nursing evaluates and reacts promptly, fairly and appropriately to ensure public protection. The latest news & announcements, publications, education trends and statistics. Access to Laws & Rules, Position Statements & Decision Trees and more resources for Nurses. Access to Program Completion Verification, Education Forms, Just Culture Information and more resources for Program Directors. Access to Resources for New Graduates and Steps for Receiving your Authorization to Test (ATT). A Position Statement is adopted by the Board as a means of providing direction to licensees who seek to engage in safe nursing practice. The Complaint Evaluation Tool was developed by the Board of Nursing to identify and clarify when practice events require a report to the Board. Stay current on periodic review of existing rules by the Board of Nursing and the Midwifery Joint Committee. The Board has adopted a "Just Culture" which promotes a learning culture that supports patient safety while assigning accountability for behavioral choices. An umbrella title for Registered Nurses who are, as defined in the NCAC 21 NCAC 36.0120(6), as Nurse Practitioner, Nurse Anesthetist, Nurse-Midwife or Clinical Nurse Specialist. Use Live Scan to obtain and transmit your digital fingerprints electronically to the State Bureau of Investigation (SBI) and Federal Bureau of Investigation (FBI). Continuing Education Offering: The purpose of this article is to provide information for nurses regarding best practices for handling, documenting, and administering controlled substances within a variety of healthcare settings while staying attuned to the signs of substance abuse and diversion. View National Council Licensure Examination (NCLEX®) 4th quarter performance results for Registered Nurses and Licensed Practical Nurses. The North Carolina Board of Nursing is excited to join Facebook to connect with nurses and the public! Follow and like our page for up-to-date information on nursing regulation in North Carolina.